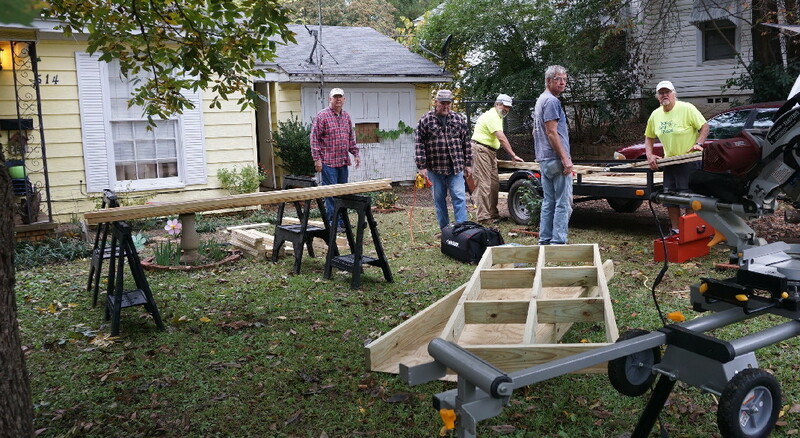 Featured image caption: These ramp builders are getting themselves poised to build a ramp in Atlanta. From left, they are Gary Grogan, Jim Moulton, Roger Geiger, Mike Simon and Pete Schroeder, all from Eagle Landing. 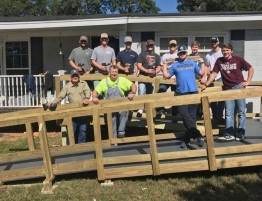 Cass County’s ramp builders do, indeed, have method in their madness. Just look and see the momentum going on. That ramp is going to be up, complete and usable, in just a matter of hours. 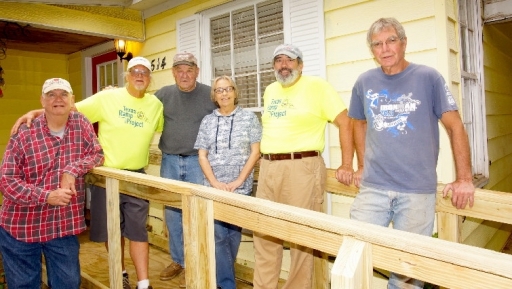 Now the homeowner—who may be disabled, in a wheelchair or housebound—will have safe and quick access inside and out, thanks to the Texas Ramp Project, a unique Texas organization. 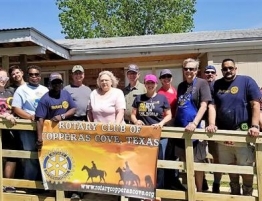 The members of this local chapter are residents of the Eagle Landing community near Avinger. The Eagle Landing builders were at 514 Piermont St. in Atlanta recently. They arrived about 10:30 a.m. and had the 25-foot ramp up by noontime. “We like to say we aren’t building pianos,” member Roger Geiger said with a laugh. “But we are building according to our plans and training,” said leader Pete Schroeder. Here’s the basic information about the Texas Ramp Project. 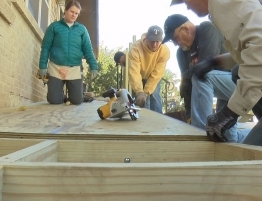 The idea of building ramps for free to those in need began in 2006. 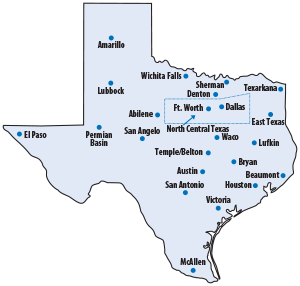 Last year, 1,955 were built in 128 Texas counties. The organization has one paid executive director. Money is, of course, voluntarily contributed as is the service of the builders. Referrals are by third-party health providers. 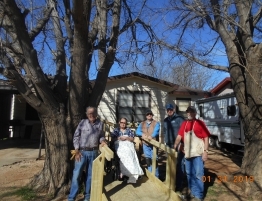 A ramp assists the resident to remain at home. It’s estimated the $700 ramp saves taxpayers up to $80,000 per year for an uninsured client who otherwise would have to live in a nursing home. “I remember the looks on the faces of those who come out to see our work when finished,” he said. This is where that “momentum” comes in, for this group of men at work may at first seem to be rushing hither and yon. But they know exactly what they are doing, and the work flows among them, everyone doing whatever’s necessary. They are, too, poking fun at one another. You don’t last long if you can’t jest back. Schroeder almost doesn’t need to say a word. He knows his role is to keep the momentum going, for the ramp’s basic frame has already been pre-built at Elo Zinke’s airplane hangar at Eagle Landing. Also, Schroeder or one of the other trained surveyors, has already visited the site and designed the ramp. The problems have been considered, and the installers are having fun installing, They use plenty of electrical equipment and make it seem as easy as if it were a large tinker toy. Still, on this site on Piermont as they were almost finished, someone has looked more closely and noticed one important beam is upside down. He called out and got the others’ attention. Then, it was a big laugh from everyone when he pointed the matter out. But no one confesses, no one knows who, and moments later, four men were taking apart the necessary frame. and And within eight minutes, the beam was right side up. “When we are done, we call the homeowner to come out and take a photograph,” Gary Grogan said. “And we leave homeowner instructions for finishing the wood, make it less slippery. We don’t do it now because wood needs to dry,” Mike Simon said. “And if after a period of time the ramp is no longer needed, we’ll come out, take it apart and save the materials for use at another place,” Schroeder said. Then, at about that time, with the equipment stowed away, someone asked if anyone had a good place for lunch in mind. They do, and the group goes off, still joking with one another. 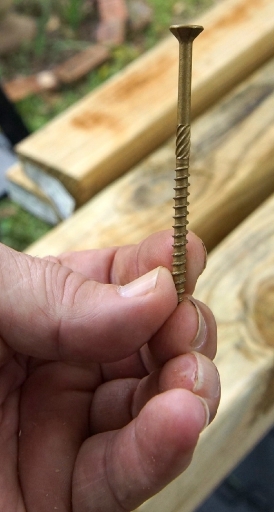 This screw is both an old and modern implement of construction. Notice its two sets of threads on its shank. Jim Moulton is both a casual builder and a knowledgeable one. 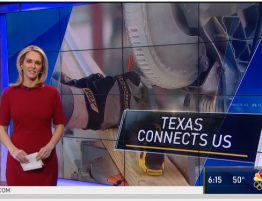 Note how he explains the screws he uses in building with The Texas Ramp Project. First, the ramp itself is put together with special screws, not nails. Then he points to the special twists built into the shank of the screw above the threads. Then, at the top, the head of screw is in a Torx pattern, not a slot. The Torx was developed in 1967 and has a trademark 6-point star-shaped pattern which makes it easier for an electric drill to place or remove the screw even in difficult materials.